Steel Ships & Space Marines refers to my generic semi-hard science, swashbuckling GURPS:Space campaign setting. The name (in case you didn't pick up on it) is a take-off from "Wooden Ships and Iron Men," a phrase associated with sailors in the Age-of-Sail (and a related "pirates" RPG), and suggests the purpose of the setting itself. At its core, the setting revolves around an Age-of-Sail historical and technological analogue. As is the case with the rest of the Daniverse, this setting is constituted in such a way as to allow all the relatable movies, TV series, books, and other stories that I like to have actually happened (at the very least, with some minor tweaking). It was also my intent to create a "shades of grey" situation with regard to good and evil on a "political scale," where the Bad Guys in most situations can also be seen as Good Guys in a different light (Babylon 5 is a good example, as are any history-based stories, where the Antagonist of the story is merely a "patriot" that so happens to be in opposition to the Protagonist). Finally, the setting was designed to allow pretty much any sort of Character imaginable to be "legitimate" to the setting; Magi, vampires, time-travelers and the like could all easily be worked in. The campaign scope includes the entire Milky Way galaxy, and does not (currently) extend beyond it. The origins of this campaign setting go as far back as late 1991, when I became involved in Phil's cooperative comic-book series efforts, one "title" of which was a space military series referred to as Earthfleet. In 1992, I purchased GURPS for the first time, and my first adventure design (which never saw "production") was a GURPS:Space adventure incorporating elements of Earthfleet and the movie, Predator. In 1994, after having left the Army and become one of a three-man gaming group, we (the group) started working on a GURPS:Space campaign based on Sid Mier's Pirates! video game; the concept was to create a randomly-generated campaign/adventure system that would allow the three of us to rotate GMing duties with a minimum amount of required preparation or coordination. We each submitted races for inclusion in the setting, and all the Earthfleet stuff I had cooperatively developed over the last few years was incorporated fully. Once again, the campaign (referred to as Empires at the time) never actually saw "production," but I would continue to develop the background and mechanics until the present day, and have featured it in three campaigns/adventures thus far (and elements of the background have appeared in other campaigns run by other GMs). In its current incarnation, it has been heavily influenced by a book titled The Aliens Colonial Marines Technical Manual, which presents pseudo-scientific explanations of the concepts, equipment and tactics from the Aliens movie (replacing the Phoenix System's Aliens RPG Sourcebook as a source), and my "formal" introduction to the Traveller universe (more of a "mechanical" influence). This is the "basic" Daniverse setting, and is considered to be canonical with regard to all other Daniverse-Prime campaigns (alternate-world campaigns tend to share a lot of elements as well). This document describes a number of stand-alone Adventures, each intended originally to be a continuing campaign. England=Confederated Human Worlds (CHW), AKA The Confederation; human-centered campaigns of galactic scope will see them, generally, as the Good Guys. The GalNat of the United Kingdoms of the Thar� (UKT) might occasionally be equated to Scotland, and the Federation of Rising Suns (FRS) to Ireland. Spain/Portugal=Ozrahdi-Kazha Union (OKU), AKA The Union; human-centered campaigns of galactic scope will see them, generally, as the Bad Guys, and more "local" campaigns will see them as a boogeyman-type threat. They are the "Evil Empire," and dominating nation of the Daniverse. The Kazha, though normally not considered separate from the Union as a whole, might occasionally be equated to Portugal. France=Tohre-Chi Commonwealth (TCC), AKA The Commonwealth or ChiCom; human-centered campaigns of any scope will see them, generally, as a nuisance at best, or an ever-present enemy at worst. They are the "Wild-Card" of the Daniverse. In some instances, the ChiCom might also be equated with the Turks. Holland=Imperial Pr�xian Repulic (RPI), AKA The Republic; human-centered campaigns of galactic scope will see them, generally, as unstable allies. Venice=the Kyahnt; human-centered campaigns of any scope will see them, generally, as stable trading partners and good neighbors. They are the "�ber-merchants" of the Daniverse. The Caribbean=The Outworlds; basically any world that is not one of the four previously mentioned, including the galactic core (although some worlds in the core are "claimed" by one or the other, by treaty, they aren't considered to be their legitimate territory). The Barbary Coast=Coreward OKU-controlled space, known for weak control. Gold=Brin/Elerium(AKA Ununpentium), the stuff that makes the universe go 'round. Religion: Dominated primarily by two factions, the "Church of the Precursors" (P-Church, =Catholicism) originating from Ozradhi beliefs, and the Universal Church (U-Church, =Protestant), an evolved amalgam of Christian beliefs of Earth-origin. Ships' Rigging: Refers to a ship's drive-system. Number of masts translates roughly to a ship's jump capacity. If there is a basic pre-existing setting used in the Daniverse, this would be it. The USCM depicted in the movie, Aliens, are the Marines of the USA (United Stars Alliance). With my discovery of the ACMTM, I incorporated a great number of the placenames and technical concepts. This was a later addition to the repertoire, but since then it has become the number two overall influence in the campaign world. Beyond simply incorporating the series events into the timeline, I found that I really liked the Chinese-American "composite culture," to the extent that I not only incorporated it, but added to it by giving each of the human "states" their own mixed cultural backdrop. Obviously, I dropped the "one star system" concept from the series. Otherwise, it all fits in nicely. I didn't incorporate the series proper, but some of the feel and structure of the way things work in the Daniverse, as well as some of the visuals. Specifically, I use the "semi-hard-science" nature exhibited in the series. The most noticeable element of the series that I incorporated is their treatment of non-atmospheric small craft, which I (and thus, the people in my universe) refer to as "Ziggies" (from zero-gee). The movie, Stargate, happened in the Daniverse pretty much unchanged, except that Ra was a Changeling (see Races), and the planet they went to was situated within the Milky Way galaxy. Although I wasn�t generally disgusted by the Stargate SG-1 TV series and spinoffs, it just doesn�t fit in the Daniverse, so ignore it. The stargate itself is Precursor tech (referred to in the series as the �Ancients�), and is not reproducible by any of the civilizations that currently exist in the galaxy. Also a late addition to the list, the events of the series really don't fit in to the overall scheme of things. However, the feel of the series most certainly does, with regard to its treatment of the science involved, and its depiction of military life and politics. The campaign setting covers the whole of the Milky Way galaxy. Habitable worlds (by known Human standards) could ultimately number in the thousands (a marginal percentage of the number of stars in the galaxy, though it would seem like a lot); less-than-habitable worlds are commonly colonized if good cause exists. Fewer habitable worlds exist near or in the galactic core, though many worlds in this area are older and mineral-rich, and so are colonized. The galaxy hasn't ever been, and is unlikely to ever be, fully explored and charted; there's plenty of room for secrets and discovery. Some "parallel dimensions" do exist, in the standard Sci-Fi sense, but are rarely encountered by average folk, outside of enlightened scientific theory; those that exist will generally follow MTA guidelines. I have limited the number of races in the setting to around 24 sophont races (specifically "builders"), of which 20 or so have been defined to some degree (the remainder are undiscovered races, to be defined as needed). Some races have been exterminated and are no longer seen in the setting, although they could be if the campaign were to take place in the past or involve time-travel. Periodically, as new folk were introduced into the gaming group and time to revisit the setting arrived, I asked the others to suggest their favorite races that might be added to the list. Initially the race designs were rather stereotypical, that is, they conformed to the standard sci-fi alien types you see in nearly every setting. They have evolved over the years into something less so, their terrestrial inspirations becoming less recognizable; in some cases, I am still refining the designs as I find new inspiration. Later in the process, I took a new tack with the setting as a whole, and developed (some) races in a more "idealistic" fashion, filling particular "roles" in the universe. Like all the other Daniverse elements, if you see something familiar, it probably is what you're thinking. B�llann: Twi'lek-inspired tentacled humanoids; subject to Ozrahdi. The setting's Bad Guys that look like Good Guys. Emminh-Rhi: Amphibious (salamander-like) with four arms and no legs; "symbiotic" partner with Tohre-Chi. Ghuar: Basic space-orks; subject to Ozrahdi. Humans Terrans, and neo-humans, Pr�xian and Thar�. Iail: Basic bird-men; subject to Pr�xians. Kazha: Basic snake-men, legless and eyeless; semi-subject to Ozrahdi. The setting more-obvious Bad Guys. Kyahnt: Four-legged heavy worlders, fill a fantasy-dwarf niche. Makke: Basic amphibious salamander-men; somewhat primitive. 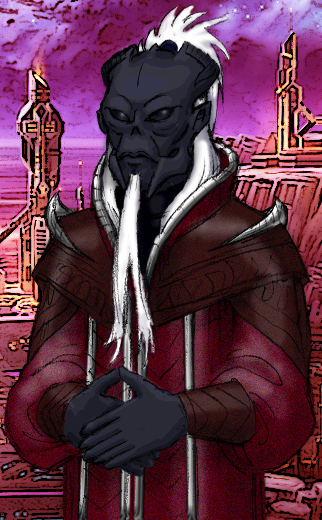 Ozrahd (image): Basic dark-elf types, from the dark side of a cool, tide-locked planet. The setting's usual Bad Guy, though more neutral than evil. The design was greatly influenced by the Ilshani (from GURPS:Space Atlas 4,). They fill a more-hostile Minbari (B5)/LotR Elves niche. They are the oldest sophont race, the most technologically advanced, and the most artistic; both feared and held in awe by the other races. [Reticulans?] (link): Standard "Greys." Galactic boogeyman to most, angels for the Precursors to others. Either way, they are seldom seen and even more rarely found intentionally. Skosra: Stretching cave-dwellers; subject to Pr�xians. Sk'ran: Basic insect-men, in the process of becoming extinct. Tohre-Chi (image): Basic cyber-men, aquatic (fish-based); "symbiotic" partner with Emminh-Rhi. The setting's "rogue element." Vogorr: Basic monkey-men, with a number of reptilian (gecko) qualities; primitives. Vonchaah: Spider-like giants with hive-mind drones; subject to Ozrahdi. The setting's Good Guys that look like Bad Guys. Yautja (link): Creatures from the Predator series. Z�rran: Kzin-inspired, though physically less cat-man�like; subject to Pr�xians. A couple of others, not appearing on the list or counted among the 24 but bearing some mention, are the Precursors and the Changelings. The Precursors are known, to an extent, by the existing races; in some cases they are "worshipped" as quasi-gods. As for most sci-fi settings that feature some sort of precursor race, they have left behind some traces of their civilizations for adventurers to find. The Changelings are not known to the existing races, and may or may not be the Precursors. They are the godlike invisible hand, guiding and/or obstructing the development of the galaxy, and are the source of the Technocracy and its aims (WoD). The overall political situation is dominated by the four major powers; Terrans, Ozrahdi, Pr�xians, and Tohre-Chi, of whom the Ozrahdi tend to be the larger and more powerful. Each is subdivided to some degree or another, and each has its own distinct culture(s), disposition and politics. Several smaller political entities exist, in the region referred to as the Outworlds, some of which include multiple systems, others are single-system entities (not unlike ancient City-States). At any point in recent history, two or more of these entities can always be expected to be at war, to some degree. By political treaty prior to campaign time, no GalNat is allowed to officially claim territory in the galactic core, though they are allowed work colonies. Confederated Human Worlds (CHW): Earth-men, several states organized under a single "federal" banner. Terran Federal Republic (TFR), includes Earth. Commonwealth of New Bretagne (CNB), seat of the CHW gov't. United Kingdoms of the Thar� (UKT), collection of Egyptian-like neo-human systems. Imperial Pr�xian Republic (RPI): Respublico Imperatorio Pr�xio. Roman-like neo-human empire, includes a number of subjugated civilizations; aggressive & warlike. Includes the "original" Old Empire and a number of colony expansion-worlds. Ozrahdi-Kazha Union (OKU): Largest empire, ruled by the Ozrahd, in chief, and the Kazha, and includes a number of subjugated civilizations; driven, expansive and structured, divided into districts of a handful of systems, all ruled from a central district by the Three Emperors. Tohre-Chi Commonwealth (TCC): Tohre-Chi and Emminh-Rhi combined, loosely organized in a number of occasionally-cooperative states; always unpredictable and chaotic, a source of much piracy, terrorism, and/or warmongering. The Outworlds: Everyone else, primarily organized into single-system nations. SecGen Benjamin Weizman dominated this era. The Confederacy had no navy of its own worth speaking of, and small hope of coordinated support from the Houses should a situation arise. The OKU, on the other hand, had a large navy, a powerful army, and a vast income. Therefore, he needed to tread lightly in his dealings with the OKU. When the PChurch hierarchy declared him a heretic and demanded his overthrow, things were especially delicate. The Three Emperors were arrogant in their pressing of their "Divine Right" granted them by PChurch, and every new Emperor was expected to follow this practice. The Emperors had been in bed with the Seven Kings and had been called the real rulers of the UKT at the time, and many Confederate leaders feared they would attempt to rule the Confederacy through them. In the meantime, the OKU was content to influence Human policy through the Seven Kings. In 2205, the UKT was sanctioned by the Confederate Council for plotting the overthrow of the Confederation. This left the Three Emperors in a quandary; who would they leave in control of the CHW when they invade? This postponed the sending of the Great Fleet and allowed the CHW the necessary time to build up their defenses. Socially, PCs can expect an exciting time during the reign of SecGen Weizman. Plots against him were common; no one knew when the OKU would attack, but everyone expected it. Privateering was encouraged and profitable. Hovercoaches were becoming commonplace at the time. PChurch sent spies in to infiltrate, urging the overthrow of SecGen Weizman. Individual Houses were plotting the same thing so they could gain prominence in the Confederacy. The Confederacy weathered the Great Fleet, and a serious rebellion by the FRS. When SecGen Weizman died in 2234, the CHW was beginning to be self-sufficient. Hemaka Nabeh of the UKT became SecGen on Weizman's death. He promptly cut defense spending, believing the Ozrahdi threat to be over, and set about trying to make the Confederacy an autocratic state, edging out the individual House gov'ts. The former Tohre-Chi Commonwealth was crippled by internal conflict resulting from the breakup of the union. There were periods of relative peace, but the weakened leaders could do nothing to prevent warfare from breaking out again. The Edict of [Name] granted a respite from internal strife by setting borders defined by the GPO, however the GPO's power to enforce these borders was limited. Each state suspected the other of pandering to the GPO for more control, but the fighting ceased, which allowed the militaries to concentrate on foreign objectives, including war with the OKU over long-disputed territories. A flimsy overlord was established by the GPO for a time, but was assassinated when he promised the CHW that he would prosecute piracy among his own people. Chi espionage at this time was primarily internal. All sides used spies. External espionage was certainly present as well. There was plenty of work for soldiers of fortune, but the pay was not good. Still, for the adventurous, a daring assassination raid into an enemy stronghold might mean promotion and glory. The RPI began to rise as an economic power at this time. The trade route to the OKU ran through RPI territory for a long time, and the gov't finally began to take advantage of this, trading between both sides of the galaxy. The OKU was taxing this activity heavily on their end, causing considerable friction between the GalNats. The emperor, taking the occasion of his son's birth in [date], declared war to avenge the OKU's trade injustices. Pr�xian privateers attacked Ozrahdi shipping from the Colonies to the NW rim. The war was short but bloody, and was aided by the CHW and ChiCom, who both wanted to see the OKU weakened. A truce was declared in [date], resulting in a cold war that lasted for many years. The Ozrahdi-Kazha Union, the wealthiest galnat in the galaxy, was the object of jealousy and greed. Although they were set upon on both sides by the ChiCom and RPI, the rest of the galaxy was still leery of the power of the Three Emperors. The CHW encouraged the robbery of Ozrahdi ships; The Tohre-Chi plotted against them when not warring within itself, and the Pr�xians fought against their unfair foreign trade policies within and without the GPO. The OKU had been firmly entrenched in the Colonies for centuries. The wealth they took from the Core was staggering - and caused its undoing. Too much wealth led to the decline of Ozrahdi trade and industry, rampant inflation and eventual bankruptcy once the flow of silima was cut. The OKU was involved in many wars during this time. In [date] the RPI declared war over trade issues. In [date] the Tohre-Chi reopened hostilities over disputed territories. War with the CHW broke out in [date], and lasted until [date]. The Three Emperors tried diplomacy, even trying to ally themselves with SecGen Weizman. They had remarkable patience in the face of Confederate piracy and privateering. The Confederacy did not want war, tried hard to avoid it, and was only partially convinced that the Ozrahd were their enemy. They had a very small navy and the OKU was very powerful. By [date], SecGen Weizman was convinced that the OKU would eventually attack. [Name] made a daring raid on the orbital facility around [location] and destroyed or damaged so many ships that the invasion was delayed for a year. The great admiral [Name], who was to have led the Great Fleet, died, and the Emperors appointed [Name], who was neither a military or naval man, as his successor. The Emperors wanted someone they could control in charge of the Fleet�old [Name] had been too independent for their liking. The Great Fleet was therefore led by a space-sick bureaucrat, who thought more of himself than he should have. Someone in the provisions department was dishonest�the food was rotten, and as a result, over half the spacehands were sick. The fleet consisted of 128 ships and [x] men and was to convey the Ozrahdi army to the CHW. It was met by the Confederate fleet, a hastily assembled conglomeration of privateers, navy and even merchant ships pressed into service. The CHW used different tactics, and the Confederate captains were had years of tactical experience starside. After breaking the Ozrahdi formation and chasing the smaller clumps of ships, the CHW folded out to their ports, while the Ozrahdi Fleet ended up jumping through an uncharted dark nebula and ending up lost. So thoroughly were the Ozrahdi battered that only 65 ships and [x] men survived. The Confederates had destroyed two ships, captured two, and damaged five more enough that they couldn't make the trip home. The rest of the ships that were lost disappeared in the dark nebula. By the time SecGen Weizman died in 2234, the OKU was too rigid to take advantage of the new SecGen's weakness. He liked the Ozrahdi and stopped the war against them. However, since he so reduced defense spending, piracy increased. Spacers couldn't get work and took to piracy to make ends meet. Most of these operated out of the FRS. They mostly raided the Ozrahdi, so there was no real respite. Newton, Einstein, and Hawking; what works, what doesn't, and my explanations and/or excuses. I tend toward what I refer to as �semi-hard science� in my sci-fi stuff�realistic, but not too realistic (reference: the TV series Babylon5, Firefly or the new Battlestar Galactica). High tech for all participants in the Daniverse is ultimately, at its root, the result of Magick (WoD), as developed and implemented by the Technocracy or related groups, and designed to be used by the non-Enlightened. Some, but not all, of the following information has been brought up to GURPS 4e standards. TL:10. Lower class is TL9, middle-class and military is TL10. A given TL can use higher TL tech, but cannot maintain or reproduce it. Nearly all technology of the entire galaxy revolves around a synthetic heavy element referred to originally by Terrans as Elerium-115, later Ununpentium; called Brin in the Ozrahdi tongue (lit. "essence"; the processed form of Silima ore (a term used by the Ozrahdi for millennia, although not of Ozrahdi origin)), and Ezo by the Pr�xians. It is a mineral naturally occurring only in planets of older star systems in the galactic core. It must be refined in microgravity. Once processed, E-115 is gold-colored, super-heavy and soft (like gold), having a specific gravity of 21.22 and weighing 1324.4lbs per cubic foot. It is generally stored and transported in rods, .15m dia (≈6"), 1m long (.624cf); one rod of fuel-grade E-115 weighs 825lbs (.41T). Generally transported in 1x.45x.45m crates of 9 weighing 4.77T. Raw Silima ore is much less dense and heavy, and is a phosphorescent greenish-gold color (Ref: Kryptonite). It is processed into several variants, including fuel-grade, industrial-grade and weapons-grade; E-115 derivatives are used as a medium for all gravitic manipulation technology and advanced beam weapons, and are used extensively in power-storage technology and explosives. Some byproducts of the refinement process are a powerful drug, called Silimanji, that can have effects that include temporary psionic abilities, depending on the users' biological makeup (among Terrans, it is referred to as "spike" when mixed in small doses with other Terran drugs). As a result, Elerium is the most sought-after substance in the galaxy, and is the basis for the galactic economy. Power is universally derived from mutual annihilation of anti-matter, fueled by E-115. Energy Banks: All use Superscience Energy Banks. Power Plant: All use A-Mat PP @TL+1. Elerium-115 is used as fuel. Solar panels are in common usage, at appropriate TL, to assist during recharging or to run systems in case of PP failure. Terrans: TL+0 Total Conversion; replace Hydrogen fuel with Elerium at [consumption rate]. UKT: TL+0 Reactionless (Force Propeller). Others: TL+1 Reactionless (Force Sail). FTL is universally enabled by what Terrans refer to as a Correspondence Drive, which uses Holtzmann-wave principles to "fold space" into a single relative point and then unfold it, leaving the vessel in a new location. The drive consists of a "core" (that includes a significant amount of drive-grade Elerium at its heart), specialized sensors to acquire the destination, and a focusing device to lock it in (referred to as the "aperture"). Travel is basically instantaneous, and requires a huge amount of power. FTL travel is a complex four-dimensional process, and despite the best efforts of modern theorists, is still more "art" than "science", requiring a great deal of intuition on the part of the astrogator (not unlike using "Kentucky windage" for a long-range rifle shot). The vessel's current location must be accurately fixed, the destination must be acquired visually using specialized sensors, and a complex galaxy model program is used to aid acquisition and to predict needed adjustments based on distance and movement. To date, scientists have not been able to devise a computer that can astrogate automatically. The size of the drive's aperture and the available power determines the reach of the drive. The farther away the destination is, and the more the star's light is obstructed or distorted by gravity, magnetics, uncharted stellar objects, etc., the greater the margin of error on arrival (the slightest inaccuracy can set the vessel days, weeks or even months away from the destination within the destination system). Correspondence drives can be difficult to control, and frequently will inexplicably lock-on obstructions near the LOS (especially nebulae and, more often, dark nebulae, for some unknown reason). This is always inconvenient, and can be dangerous. As a result of the inherent danger of miscalculation, most spacers will only use proven, well-checked, guild-certified courses. Spacer legends abound about careless spacers using unproven courses and never being seen again. A reliable from-scratch course may only be computed if the Astrogator has complete up-to-date charts of the region. Often-used and user-modified courses are kept on the astrogator's blackbox, which experienced astrogators keep a closely guarded secret. Astrogation skill is M/VH, and only taught to an elite few. Some accomplished astrogators sell their work for a high price, making some of them quite wealthy and famous. Natural jump gates, or wormholes, are spatial anomalies that act like a magnifying lens, allowing much longer jumps at safer margins of error. Oftentimes, a course will incorporate several wormholes in a chain, to further increase the effect. Wormholes are relatively common, although rarely useful, and new useful wormholes are an exciting find. It is possible for a single vessel to create a Holtzmann wave large enough to encompass other vessels along with it, for towing purposes and such, but power requirements tend to make it more efficient for each vessel to have its own stardrive (except in the case of some small or fighter-craft). A tandem-jump is generally only attempted when the vehicle being towed either has no stardrive, or its stardrive is non-functional; otherwise, the operation is performed as a parallel jump. Gearing up for a tandem-jump requires a Chk:Engineer(Stardrive)-1(�size mod difference); Fail=stardrive burnout. Route descriptions should include a "Malfunction" number indicating its difficulty (e.g. 16 if course is completely unobstructed (rare), 14 if course goes through the core systems or 12 if course is obscured by nebulae or similar phenomena). If the die roll equals or exceeds the Malf number, the drive has locked onto the wrong target and the vessel will emerge in the wrong location (GM determines the exact nature, based on course description if available). Any of these conditions can be made into a Technique. Insystem Navigation: To reach a particular in-system destination, Chk:Navigation+3 (in-system Navigation checks are easy) and Piloting/Shiphandling (both at -4 if performed by the same person on a "capital" vessel); (worst)Result=�2% to trip time per point (Crit=�1d Result). Average travel time between in-system destinations can be assumed to be the distance from the star to the farther destination, in AUs. For more detail: the minimum separation is the difference between the two orbit radii, and the maximum separation will be the sum of the two orbit radii. The two planets (or whatever) will reach the shortest and longest point once each within the faster planet's year-cycle -one will be at half the year from the other. At any other point in the cycle, actual distance can be adjusted accordingly. The GM can roll a d% to randomly determine the current separation percentage, and a d2 to determine whether it is increasing or decreasing. Compute travel time by distance (in AU) using the chart/formula on S132. As a Technique, this can be improved to a maximum of Default+2. Fixing Position: Assumes a guild-standard blackbox and guild training. Chk:Astrogation; Succ=position is fixed within close enough tolerance to plot a course; Fail=-1 to course per -2 result. Modifiers include +1 for a familar (or home) system. As a Technique, this can be improved to Default+2. Existing Course: Assumes a guild-standard blackbox and guild training, and the vessel is at the recommended jump-off point. The attempt takes a base of 30min to lay-in the course. Each course description includes a difficulty modifier (how tricky it is to lock-in the system) and a "Malf" number (the presence of LOS obstructions). Chk:Astrogation �[mods]; must designate a destination (planet, station, jump-off point, etc.) within the target system. Modifiers include +1 @<� Reach, -1 @�-� Reach, -3 @�-full Reach, -5 @full-1� reach (max); if the vessel is not at the recommended jump-off point but is still in-system, -1 for 1hr, and a further -1 per doubling (-2 @2hr, -3 @4hr, etc. ); standard Risk, Equipment and Time modifiers. Result(abstract)=final position in-system (relative distance (Pc)) x .001 AU from destination �(result x10% (10% min)); cSucc=10%, regardless of actual result (other effects @GMD); cFail=see Astrogational Errors. If needed (@GMD), a single/double-clock check (1d12 (x2)) may be used to determine direction from destination. If the die roll equals or exceeds the "Malf" number, the vessel is diverted, regardless of skill. This is the basic skill, and cannot be improved as a Technique, although individual penalties may be reduced as individual Techniques, up to Default level. Parallel Jump: The Astrogation solution for a single ship may be passed on to other ships in a convoy. In such a case, the Astrogation check is made at a further -1, and all ships in the convoy must be close together (-1 to -3 depending on how spread out the convoy is). As a Technique, this cannot be improved above Default. Blind Jump: Blind jumps to a particular destination (when the destination is totally obscured) use pure intuition, and are at a base of -10, plus distance, Time and Equipment modifiers. Jumping blindly to "anywhere but here" is also at -10, but either the Astrogator or GM picks a random target (location/distance) and treats it as a "wrong system" result below. Blind jumps are at -2 Malf (for known courses) or a new (randomly determined) Malf. As a Technique, this may be improved no higher than Default-5. Diversion Recovery: If a vessel is diverted by a course-hazard, the course will have to be re-plotted, or a new course created. If the Astrogation check succeeded but was diverted anyway, the vessel is still basically on-course; treat as existing course at the current range. If the Astrogation check failed, the course must be created from scratch from the vessel's current position (at +2 for mFail). Course Plotting: Assumes guild-training, complete charts of the area, a guild-standard black-box, and requires a base 100-(EffSkill x5)hrs. (Sct)Chk:Astrogation-5 �[mods]; Result=course difficulty �1 per �3 result; cFail=cannot plot course; mods include -1 per 500Pc (or fraction), +2 for being on-site, and standard Equipment and Time modifiers. Starting Malf number is determined by GM (arbitrated or randomly determined (10+1d6)), and is improved separately. Once plotted, it is considered "untested" until it is actually used; the GM may say the Character has a good or bad feeling about the new course, but he won't really know until it's been tried. Once it has been used, the difficulty and Malf number is known, and it is considered "existing". Even a generally crappy course will still be usable, and it may be improved upon later. As a Technique, it may be improved up to Default+3. Course Improvement: Works generally like plotting a new course. Astrogator must choose to adjust either difficulty or Malf. When attempting to adjust difficulty, check as for plotting a new course; Succ=+1 improvement; xSucc=+2 improvement; cSucc=+2 improvement and +1 Malf; cFail=Astrogator cannot improve the course (or other result @GMD). Attempting to improve Malf by finding a better way around obstructions requires a check as for plotting a new course; Succ=+1 Malf; cSucc=+2 Malf; cFail=cannot improve the course. Time-lost(abstract)/off-position on normal Fail, as described above; cFail=wrong system (GM arbitrates or determines new destination randomly using Grenade Scatter (distance in 100Pc); re-roll Astrogation check for system position, based on available destinations in target system), or must take evasive action to avoid hazard (danger-close to planet(oid) or comet, in the middle of asteroid field or meteor shower, in the gravity well of planet or black hole, etc. ), the nature of which is determined by the GM (arbitrate, or determine randomly); if new position is not currently charted, a new course must be plotted. If the vessel is diverted, the GM may arbitrate or randomly determine the nature of the diversion. Once the immediate situation is dealt with, a new course must be set-in from the current location. Dark nebulae will be the most common "unintended" destination, as they are difficult to see or predict. A vessel caught in any nebula will be blind (visibility anywhere from 10-1000km); some particularly nasty nebulae are inhabited by asteroids, protostars or stellar debris that can damage or destroy a vessel. A vessel caught in a nebula will have to either wait for a "break in the clouds" or make a blind jump. Roll 1d6 per day (if the vessel remains still) or 4-hr period (if the vessel is moving); 1=pass through, 2=conditions ease (temporary break, thinning, debris clears), 3-4=no change, 5-6=conditions worsen (visibility reduced, debris increased). A vessel that is moving risks collision (avoidance is more or less difficult based on visibility and speed). Guild members have a +1 bonus to all astrogation checks when in the Guild's (not the astrogators') home sector. The Navigators: Navigators are more familiar with hazards in the Human Sector; +1 Malf on all standard courses in the Human Sector. However, Navigators are cautious about unproven courses; -1 Plotting. The Spacing Guild: Guildmen are more adept at avoiding astrogational hazards; Malf +1. However, their extensive calculations take extra time; +50% time for any Astrogation check. The Brotherhood of Steersmen: More seat-of-the-pants than the others, training Steersmen to use their intuition to maximum effect; +2 to Plotting and Blind Jumps. Their chaotic tendencies is passed on through their instruction; +500Pc to jump distance for purposes of calculating ETA for all jumps. The Calculators: OKU pilots value long reach, and are more familiar in the Ozrahdi Sector and the Core Systems; �+ reach is at -2 (instead of -3). They are also more experienced with ultra-short range jumps; +1 to microjumps, only when using Ozrahdi equipment. However, they don't respond well to chaos; -2 Recovery. Informal Training: Astrogators are sometimes illegally taught by (former) guild members, especially among pirate/smuggler crews or similar situations. In these cases, they are generally less precise and disciplined; +500Pc to jump distance for purposes of calculating ETA for all jumps. Without formal training, plotting new courses is dangerous; -4 Plotting. Individual Schools: Splinter groups of existing guilds, secret societies, or pirates might have their own specialties, @GMD. Execution of a jump requires three checks, as per GT119; Piloting and Engineer checks are treated as a standard (forced) Assist check for purposes of calculating the Astrogation result. There is a slight visual distortion around the ship at both the Window and destination simultaneously, as it winks out of existence and winks in at the destination. The signature is more pronounced when viewed on gravitic detection sensors, as a torus-type wave signature around the ship that expands at nearly the speed of light, continuing for many AU's before it dissipates. This gravitic signature is shaped differently for different types of stardrive, referred to as the drive's "fingerprint," and can be used to identify an incoming ship. The ship retains velocity and orientation through the jump (actual, not relative, as per GT119). Microjumps are jumps within a given star system. Although covering much smaller distances than normal jumps, microjumps are not easier, due to mechanical constraints of stardrive technology, and depend as much on the (Stardrive) Engineer as the Astrogator. They still require a clear line of sight, which can be problematic near asteroids and such. Generally, the longer the stardrive's reach, the more difficult it is to perform microjumps. In addition to the normal Astrogation prep requirements, a microjump requires 30min of Engineering (Stardrive) work to re-tool the aperture. ETA result=normal ETA (figured as above) or remainder /(success result) or x(failure result). It is entirely possible for a microjump to take the ship farther from it's destination. Base difficulty for a microjump is -(ship's Reach/500 (round off)). Some smaller ships not meant to leave a system are built with stardrives that are only capable of microjumps, and their astrogators perform these jumps at +0, and do not require any Engineers' assistance. As a technique, this can be improved up to Default+3. It is possible to tow another vehicle through a jump, by extending the threshold to encompass both ships. This requires a Chk:Engineering to successfully tune the stardrive for the jump; Fail=drive failure/burnout. As a result of power requirements, the effective Reach of the drive is reduced by the same percentage that volume is increased (by adding the two vehicles' displacements together). It is possible to temporarily extend a ships reach slightly, at a higher power requirement and risk of burning out the drive; Chk:Engineering; Succ=result x2.5% (25% max). TL12 type (TL13, OKU). Gravity manipulation technologies and the secrets of Silima were "given" to all the races by unknown sources. At less than TL11 this technology is still not fully understood, but by TL11 some of the concepts are beginning to be grasped, allowing some modifications. TL12 Countergrav (CG) tech works by "screening" the countergrav unit from part or all gravity affecting it, needing other methods to actually propel the craft (usually A-Mat pulse drives). The ship itself still feels the effects of gravity, but it is suspended by the CG units. These are usually placed on the bottom or sides of then craft in a landing gear-type configuration. TL13 (Repulsorlift) actually change "gravitic polarity", causing the craft to repel the gravity source like a like-poled magnet. At TL9, countergravity is primarily available for Capital-scale and Fighter-scale, and is available at Vehicle-scale at TL10. Anti-Gravity Generator (AG) coils are usually placed on or near left and right sides with overlapping fields so as to equal out the pull and avoid things drifting toward the center of the craft. A more expensive method is Grav-Gen plates producing an evenly distributed field. Lateral Gravity Compensators (G-Comp) are usually set with a split-second delay so the movement of the ship can be felt slightly. Axial G-Comps are usually set to screen all but a fraction of acceleration so movement can be felt slightly. Ships almost always use the following combination components: Stardrive serves as axial G-Comp; CG/AG unit serves as AG or CG (selective), and lateral G-Comp (constant). All shield technology is 2x cost, including force swords. All Force Fields and Deflectors are semi-transparent, gold-colored (Ref: Dune), and distort visibility somewhat into and out of the field. OKU have omni-directional vehicle-scale shields/deflectors. Deflectors are velocity-limited, giving no PD vs. melee weapons (except force swords). Force swords are available at TL11. Uni-directional vehicular shields/deflectors are generally used in pairs, one on either side, and may be angled to protect either the front or the rear. Kazha ships use older uni-directional shields/deflectors. Personal-scale uni-directional deflectors are available. RPI have uni-directional vehicle-scale deflectors only, although personal-scale deflectors are just becoming available. Most communications gear can detect the race of the speaker through voice-patterns, and may identify the speaker specifically if appropriate databases are available. Bioscanners and Chemscanners operate as per "hard science" options, per SP70. This also applies to bio or chem functions of multiscanners. Vehicular Chem/Bioscanners have 1% listed range. Computers jump +2 Complexity/100x storage capacity per TL, rather than the standard +1/10x. All except Terrans are -1TL in computers. CHW uses 3.5"dia flat circular CD-type disk, usu. w/ cover; FRS, Kyahnt use a 2" cube; UKT uses a crystal a la B5 ; ChiCom uses a .5"x3" crystal rod ; OKU uses a 2" metallic sphere w/ ring-type retracting handle. Capacity is per UT or UT2, generally universally referred to as an "OSD" (Optical Storage Device). Holograms require a glass or clear plastic "screen" (generally curved) to project onto. OKU uses a quasi-freestanding hologram technology using a deflector screen as its medium. Nano-tech is too complex and precise to be of widespread industrial use until TL12 (Technomancers). Ozrahdi (TL11) have available nanotech at 3x cost. Bioplas is unavailable until TL11. Power Cells rule is in effect, at double the weight; D-E cells for weapons are belt/backpack mounted respectively. Vehicle-scale weapons (including man-portable heavy weapons) are available at intro-TL, personal scale one TL later. Beam weapons are equivalent to TL4 Black Powder weapons. Max RoF for any beam weapon (UOS) is ~2 (due to slight firing delay); full-auto does not currently exist, except with gatling-type multibarrel weapons. BW have a tendency to overheat which is aggravated by rapid firing (not allowing the weapon to cool between shots); maximum Malf is Crit at RoF 1/3, and adjusts one step down per additional RoF adjustment at introduction TL; overall reliability improves by a maximum of one step at next TL. Treat malfunctions as for a Level 1 Autofire Conversion (UT22). Malf is raised to Ver(Crit) for all Beam Weapons, regardless of RoF, while in space due to the extreme cold (since malfunctions are primarily heat-related), and malfunctions that do occur are usually something other than overheating. Produces a significant amount of waste heat during normal firing, making them hard to hide from IR sensors. "Wind-up" BW's (Ref: MinReport); slower to fire (RoF:1/2), but more-or-less infinite charge, variable power (like pump pellet gun); each Turn spent in a Ready maneuver, charging the weapon, provides it with a +2 damage (convert to dice, when applicable); SK:RapReload can shorten this requirement (see BPW). Personal-scale blasters available at TL11, vehicle-scale at TL10, plasma blasters available 1 TL earlier, omniblasters available at TL11. Xray, Gamma lasers ineffective in atmosphere -divide range by 1000 in atmosphere, multiply by 100 in vacuum. Charged particle beams ineffective in vacuum, neutral particle beams ineffective in atmosphere. Man-portable or aerospace units typically have selectable settings. Ships are too expensive to be mass-produced in any way, and are custom built, usually commissioned by corporations or government agencies (primarily the military) and the occasional multi-millionaire. They are, however, common enough that pretty much any Joe Spacer can end up with one in spite of the high price tag, either by inheritance, capture or salvage. CHW Ref: Earth Alliance, B5; only replace "meters" with "feet" for proper size. USA, TFR, MF, CNB and Chi-Com prefer head-on engagements; all others prefer side-on. USA, TFR, MF and CNB are orbital only, except cutters or patrol craft; all others are re-entry capable. USA, MF, CNB, FRS and ChiCom use full-size carriers; OKU and RPI use squadron carriers; UKT has no dedicated carrier, all capitals carry fighter complement; Kya have no dedicated carrier; TFR uses battlecarriers, no battleships; USA has one battlecarrier. Composed of exclusively non-ferrous metals and composites (reducing the magnetic signature), have advanced emission cloaking systems, chameleon skin coverings, and are geared to run for long periods without artificial gravity. Chi pioneered this type of vehicle. Terrans followed with their own, in response to the constant Tohre-Chi pirate threat. Undetectables are used only by Chi-Com and some Houses of the CHW. Dedicated courier/mail vessels, if not part of an express "chain", typically carry extra Energy Banks, enough for more than one jump, to save layover time. In OKU or ChiCom, military officers are "granted" a ship as a reward for service in a sort of co-ownership, position often may be bought. In Chi-Com, an individual may challenge the current owner-captain and win a ship by defeating him. CHW: Corp (non-warships) or Gov't (warships), as per 17th cent. Captures property of Captain or Corp, depending on the contract; military captures always property of the military. Kya: Corp/Civ, some small system defense craft owned privately. Captures property of Captain or Corp sponsor, depending on contract. RPI: All shipping owned and operated by the Spacing Guild. Captures property of the Guild. OKU: Gov't, although a ship will typically stay within a particular family. Captures property of Gov't sponsor, often "given back" as a commendation. TCC: Gov't. Captures considered property of Captain but pass on to Gov't when that Captain retires or dies. Ozrahd do not name ships, although the CHW has "code" names for Ozrahdi warships, markings are individual, gaudy and generally change with ownership; ChiCom ships named after its captain, considered the same entity. Ozrahd have perfected a thought-controlled steering system (Ref: Firefox). Must be able to think in Ozrahdi Common in order to use. Cloning full bodies at force-growth speeds is unavailable, although individual organs may be grown at a somewhat accelerated rate, and full bodies may be grown at normal speed. Braintaping is unavailable. The technology for cryonic suspension is widely available, but not widely used, due to an old pirate tactic of hitting a ship quickly before the ship's computers can wake everyone up, and in the OKU, an distrust of automation. Spike: Smoked (usu. combined with another smokable substance, hence the name) or taken orally, doses are ver small, very expensive, illegal in most GalNats as of 2248 (science prior to 2248 has yet to link AND to its use). Causes temporary sometimes-beneficial brain tumors (Ref: Phenomenon). Multiple doses at once (per dose) grant duration +100%, as well as increasing the HT penalty by -2. Unless otherwise specified by GM, latent abilities should total +50pts and psychosis should total -50pts. Causes euphoria, gives Enhanced Time Sense, must make HT-5 check, hallucinations or other weirdness on failure, psychosis on Crit Fail, latent abilities become active on Crit Succ, effects last HT-8 hrs (psychosis or latent abilities are permanent), very mentally addictive. Skin tingle, must make HT-4 check, �1IQ per 2 succ/fail, awaken latent abilities on Crit Succ (Ver.Crit), permanent IQ loss on Crit Fail, effects last HT min. No obvious effect, must make HT-3 check, �1IQ and PR per 2 succ/fail, awakens latent abilities on Crit Succ (Ver. ), stunned for duration on Crit Fail, effects last HTx3 min, rumored to cause severe psychosis and other health problems, but not scientifically proven. AND: A relatively new phenomenon, believed to be caused by long-term handling of raw silima, although studies are inconclusive and preventative measures have been little help. Early symptoms include shaking, paranoia and general craziness. Symptoms worsen quickly, usually resulting in victim "going postal." Most subjects die by violence before the full course of the disease is reached, aggravating research attempts. by 2248, it is known that AND is directly related to spike usage, resulting in the ban of the drug. Phosphorous Pills: Dietary supplement for phosphorous-based organisms in lieu of a proper dietary source. Coated in a substance that prevents them from being ignited in contact with air. Ignite when smashed or broken open (and in contact with oxygen). TL8/9 gear still more common than TL10. Electronics generally 1-step better @$; photonics commonly available. Distinctive "chainsaw" monowire utility shortsword/cutlass in universal military use. Primary method of motive thrust in small and capital craft is the ForceCoil (Ref: Hovercraft �pads�-Matrix); generates velocity 360� along the edges. Does arc in most atmospheres, and does produce a kinetic wake. Slugthrowers (inc. gauss) going out of style, becoming less common. Mostly Advanced: TL11 tech not readily available. Quantity over quality, military tends toward less expensive solutions. TL11 gear is widely available to special forces and such, considered "highly sensitive." Primary method of motive thrust is the ForceSail (Ref:TIE panels); generates velocity in the forward along the edge (may be reversed). Does produce a kinetic wake, but does not arc in atmosphere. Considerably more efficient and damage resistant than Thar�an design, with a generally larger �sail� surface area. ;Extensive use of 'droid troops. Slugthowers are primarily E-Therm type. Some experimental TL11 tech becoming available on a limited basis. Advanced (TL11) in a Science: Stealth (BT), Cybernetics (BT). Retarded (TL9) in a Science: Computers. Retarded in an Art: All. Chi-made goods are always waterproof. Chi-built tech tends to be somewhat bulkier and uglier. Primary method of motive thrust is a variation on the ForceSail, using several large �flaps� hinged at the rear mounted at the ship�s stern, that vary their thrust generation through open flap angle (Ref:Vorlons). Does arc in most atmospheres, and does produce kinetic wake, although the external gravitic signature is generally much harder to detect. Chi ship design is very stealthy; slick, low-profile for atmospheric/submersible craft (Ref:B-2). Hulls always made of EM absorbent material. Warships tend to have a patchwork look to them. All Chi ships are designed for head-on engagements. External weapons designed to be �tucked� to reduce signature. Atmospheric craft are designed to re-enter atmosphere/water in reverse. Nearly all aerospace and air/watercraft are submersible. Cyberware cost is lowered 25%, obvious cyberware availability increased by one step. Slugs are nearly exclusively liquid-propellant type. Advanced: TL11 tech available, but TL10 still quite common. Advanced in an Art: Visual Arts. Advanced in a Science: Ergonomics (BT). Retarded (TL9) in a Science: Computers, Robotics, General Automation. Quality over quantity, aesthetics and ergonomics over function . True automation is rare, no "automation" discount available. Ozrahd export TL9-10 antiques at greatly exaggerated (as new) prices. Exports generally only sold to FRS or UKT reps.
TL11 goods not for sale to outsiders, incurring extreme penalties for violators. "Flamberge" force swords available, no extra effect, double cost. Force swords are toys for nobility and are in common, but not official use. Way too confident in shield technology. Advanced in a Science: Magnetics (BT). All magnetism-based products can be had at 1/2 cost or +50% effect. Slightly Retarded: TL10 tech not readily available.